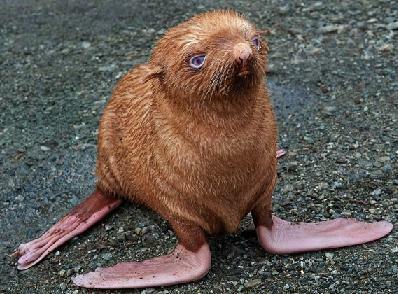 A rare albino seal pup with ginger-colored fur was abandoned by the colony in Tyuleniy Island, Russia. He was hiding beneath logs when the photographer spotted him. “The poor seal is almost blind and so was unlikely to survive in the wild,” said the photographer, who was with staff from a dolphinarium who took it into their care. The seal will be raised there to maturity and then fed to a polar bear.